A Slotstik classic for over two decades, the SLOTVAC has wide appeal among all skill levels. A full-volume deck increases float and a moderate entry rocker, coupled with a hybrid rail shape, makes this skim highly adaptable and rider friendly. A Slotstik classic for over two decades, the SLOTVAC has wide appeal among all skill levels. A full-volume deck increases float and a moderate entry rocker, coupled with a hybrid rail shape, makes this skim highly adaptable and rider friendly. 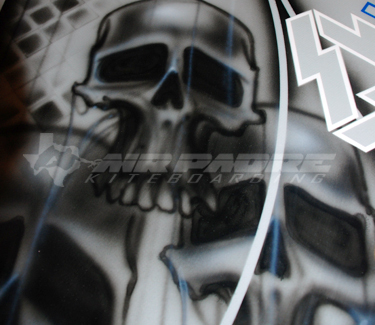 Custom airbrushed skull graphics will set you apart from the rest! 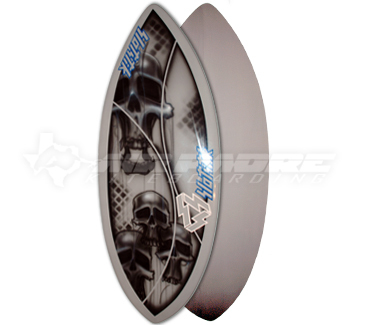 Slotstik Skimboards are fantastic boards for light wind kiteboarding as well as skimboarding. The wide flat board makes for a huge surface area and float. 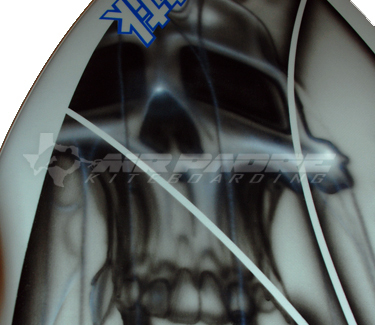 Skimboards will go upwind better than any other kiteboard on the market, and for a much lower price. 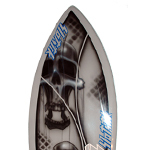 Slotstik skimboards are the highest quality skimboards you can get your hands on! They are incredibly durable and will last much longer than any other skim on the market. Riding a skimboard behind a kite is unique feeling, and can be quite fun. Since there are no fins on skimboards, it makes for a glassy ride. Using the rails to carve upwind, you can ride in very little wind. The ability to put your feet anywhere on the deck, also improves the upwind capabilities of a skim.